These are the former members of the Arizona State Parks Board. Board Members are listed chronologically by their first year of volunteer service. Read about the creation of the Agency and its first Board below the list. 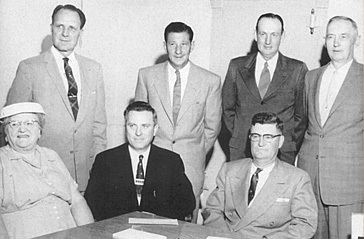 Members of the first Arizona State Parks Board, 1957 included (Back row, left to right) Max Connally, Ricki Rarick, Ezekiel Taylor, Obed Lassen, (Front row, left to right) Frances Weedon, Charles Reitz, and Virgil Mercer. Arizona became the 48th State of the United States on February 14, 1912, making it one of the youngest states. This is also true for the Arizona State Parks System, which is young compared to other state park systems, as it was established in 1957. The origin of Arizona State Parks can be traced to a period just after World War II. Between 1950 and 1958 the State’s population grew approximately 66 per cent. The United States Bureau of Census recorded the rate of income growth in Arizona as the highest in the nation for this time period. The State’s wealth once scattered among cattle ranches, farms, mining operations and logging mills, rapidly shifted to concentrate in financial establishments and industrial developments in Phoenix and Tucson. On the national scene, the American Institute of Park Executives and the National Recreation Association encouraged the development of parks with facilities and programs to provide activities for people’s leisure time. In the early 1950s, several legislators introduced bills in an effort to establish a state agency to promote, develop and provide for the use and conservation of the State’s natural resources. In 1952, Representative Robert E. Morrow of Mohave County introduced a bill to create a Department of State Parks and Monuments. His bill received little serious consideration that session and was introduced again the following session where it again died in committee. A bill that would have created a Natural Resources Board was introduced in 1954, but died in committee. It was introduced the next session with the same results. A bill was introduced in 1956 that authorized the establishment of a study committee to investigate and report back to the legislature the next session on the need for a state parks department. That bill passed the House but died in the Senate. These bills failed because the political influence of the grazing and agriculture interest was so strong. Following the numerous unsuccessful attempts to create a state parks system, some influential individuals begin building a public interest group. This interest crystallized around a 1956 article written by Ben Avery, the outdoor reporter for the Arizona Republic. The article pointed out to citizens that Arizona was the only State in the nation that did not have a state parks department. The article stated that many historical landmarks and scenic areas of the State were being vandalized through a lack of public interest and concern. As a result of Avery’s article outdoorsmen, conservationists, and interested citizens joined in an effort to protect some of these areas. Notable speakers met with the group to support their cause, one of which was Conrad Wirth, Director of the National Park Service. The group received support from the National Park Service, the National Recreation Association, the American Institute of Park Executives and the National Conference on State Parks. Meetings of this group led to the formation of the Arizona State Parks Association to carry the cause for legislation to create a state parks agency. 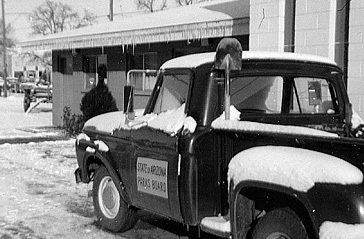 The Arizona State Parks Board Pickup Truck at Lyman Lake State Park in 1964. The Arizona State Parks Association was officially established on June 22, 1956. Composed of many influential citizens, well organized and funded, the Association accepted the task of encouraging the State legislature to establish a state parks and monument department. The Association contacted all legislative candidates to inform and seek their support for the 23rd Legislature to pass a bill to create a state parks agency. The Association established a speakers group to take the cause to civic groups, public organizations, churches and any group that needed a speaker. The Association anticipated opposition from the agriculture and grazing lobbies in the legislature. So, the Association invited representatives from statewide grazing and agriculture organizations to work with them to get a state parks agency created. At the Association meeting in October 1956, Dennis McCarthy, Henry Swan, Charles Reitz, and Kenneth Smithee, representing the Arizona Recreation Association, presented a motion requesting that the word “Recreation” be added to the name of the Arizona State Park Association. The Constitutional Committee of the Association gave serious consideration to including “Recreation” in its name. Following lengthy discussion, the Committee concluded that the recreation field was well represented in the State by the Arizona Recreation Association, thus, there was no need to add it to the Associations name. So by vote of the Association, the motion failed. Through the efforts of the Arizona State Parks Association a draft bill was prepared and ready for discussion at the December 1956 meeting. Two budget proposals were included for consideration with this first draft. The budget request for the first year of operation was for an appropriation of $30,000 to establish the State Parks Board, select a Director, and initiate a survey of potential park sites. The second year budget proposal called for an appropriation of $100,000 to develop two pilot park projects. This roughly drafted bill caused considerable debate at the meeting. Opposition came primarily from the agriculture and grazing interests, with several areas of concerns identified throughout the bill. The draft bill was reworked and submitted for a second review at the January 1957 meeting. A compromise was reached with the agriculture and grazing representatives. The compromise provided for the protection of water and grazing rights and for the appointment of a seven member parks board by the governor. The board would have two members representing the grazing industry, one employed in the professional field of parks and recreation, and the State Land Commissioner. The remaining three would be selected at large. Some Association members expressed opposition because of the heavy representation given to the grazing industry. However, the Association approved the reworked bill when the grazing industry assured the members that it would support this bill if it were introduced as drafted. The bill was described as a reasonable compromise although some members of the recreation group thought the Association had compromised too much, particularly as related to the 160 acre limitation which the grazing interest succeeded in placing on any land acquired for state park purposes. The draft bill as approved by the Association and supported by the grazing and agriculture interests was introduced as House Bill 72 and as Senate Bill 61 in the 23rd legislature. In the House the bill was introduced by the Committee on Livestock and Public Lands. Because of the strong public support, House Bill 72 passed the House during the week of February 11, 1957. Senator Robert E. Morrow, an advocate of the state parks system who had first introduced state parks legislation five years earlier, guided the House bill through its passage in the Senate. Governor Ernest McFarland signed House Bill 72 into law on March 25, 1957. This legislation mandated the State Parks Board to “Select, acquire, preserve, establish and maintain areas of natural features, scenic beauty, historical and scientific interest, and zoos and botanical gardens, for the education, pleasure, recreation, and health of the people, and for such other purposes as may be prescribed by law.” As there was an Emergency Clause in the Bill, the legislation became immediately effective. Governor McFarland announced the appointments to the first State Parks Board on April 22, 1957. The members appointed were: Max Connally, Chairman from Tempe, Charles J. Reitz from Yuma, Ezekiel B. Taylor from Cottonwood, Ricki Rarick from Tucson, A.V. (Virgil) Mercer from Mammoth, Frances Weedon from Phoenix and O.B. Lassen, State Land Commissioner. The enabling legislation appropriated $30,000 to the Parks Board for its first year of operation. The new Board’s first act was to initiate the transfer of title for Papago Park. It also received applications for the director’s position and began the survey process.